Devour compliments all night long with the glamorous sparkle of the Hello Kitty Gold Plated Earrings. 1.7 x 2.1 cm/0.39 x 0.78. 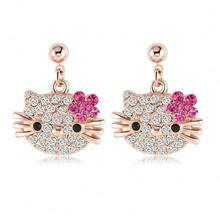 Very cute earrings would recommend to family and friends would buy as a gift.